Breathing in a long breath, one knows one is breathing in a long breath. Breathing out a long breath, one knows one is breathing out a long breath. Breathing in a short breath, one knows one is breathing in a short breath. Breathing out a short breath, one knows one is breathing out a short breath. Breathing in, one experiences the whole body. Breathing out, one experiences the whole body. Breathing in, one relaxes the bodily formations. Breathing out, one relaxes the bodily formations. Breathing in, one experiences joy (or enjoyment). Breathing out, one experiences joy (or enjoyment). Breathing in, one experiences pleasure (or well-being). Breathing out, one experiences pleasure (or well-being). Breathing in, one experiences one’s mental formations. Breathing out, one experiences one’s mental formations. Breathing in, one relaxes one’s mental formations. Breathing out, one relaxes one’s mental formations. Breathing in, one experiences the mind. Breathing out, one experiences the mind. Breathing in, one has satisfaction of mind. Breathing out, one has satisfaction of mind. Breathing in, one composes the mind. Breathing out, one composes the mind. Breathing in, one liberates the mind. Breathing out, one liberates the mind. Breathing in, one contemplates impermanence. Breathing out, one contemplates impermanence. Breathing in, one contemplates fading away (of clinging). Breathing out, one contemplates fading away (of clinging). Breathing in, one contemplates cessation (of clinging). Breathing out, one contemplates cessation (of clinging). Breathing in, one contemplates relinquishment. Breathing out, one contemplates relinquishment. The Anapanasati Sutta: Mindfulness of Breathing. This is the sutta (Pali– ‘sutra’ in Sanskrit) in which the Buddha lays out his guidance on practicing this kind of meditation. Larry Rosenberg talks. Lay Buddhist teacher Larry Rosenberg (author of “Breath by Breath: The Liberating Practice of Insight Meditation“) says of his teaching approach: “The method I use most in teaching is anapanasati or mindfulness with breathing. Breath awareness supports us while we investigate the entire mind-body process. It helps calm the mind and gives us a graceful entry into a state of choiceless awareness–a place without agendas, where we are not for or against whatever turns up in the moment.” Here is a link to a page of audio files of his teachings at DharmaSeed.org. Click on the white bar that says ‘Select from Larry Rosenberg’s 308 Talks’ and find a host of them on anapanasati. Gil Fronsdal: Fronsdal is a leading lay Buddhist teacher and you can find his teachings on anapanasati practice at this link at AudioDharma.org. Those of you who have visited the Bhavana Society Therevadan Forest Monastery in High View, W.Va., the first Therevadan forest monastery in North America, know what a special place it is. Led by internationally known abbot and Buddhist scholar Bhante Gunaratana, Bhavana is a rich source of Buddhist teachings rooted in the Pali canon and the Buddha’s original teachings. Within the past year, some lay followers have developed some social media sites that feature Dhamma videos of teachings by Bhante G and other Bhavana monks, Dhamma quotes and imagery. DN 22 Mahasatipatthana Sutta: Is approximately identical with a fuller description of the Four Noble Truths. MN 118 Anapanasati Sutta: Mindfulness of Breathing. A good starting place for beginning or restarting a meditation practice: “Mindfulness in Plain English” by Bhante Gunaratana, a classic guide to starting a meditation practice, which has been translated into more than 20 languages. Australian monk Bhante Sujato. of Santi Forest Monastery in Bundanoon, Sydney in Australia., can be heard at the above link on the practice of metta or loving-kindness meditation, as taught by a monk in Bangkok with whom Bhante Sujato has studied. In this guided meditation, he leads a 30-minute meditation on the basics of working with the attention as you first begin to sit. Along the way of introducing this metta meditation practice, Bhante Sujato undertakes an illuminating survey of the different kinds and methods of Buddhist meditation. The talk heard here is a shortened version taken from a rains retreat — the talk is edited down a bit. Seek out this and other talks by this very interesting Western monk who trained with Ajahn Brahm. Bhavana Society: A Therevadan Buddhist forest monastery and retreat center near Wardensville, W.Va., founded by the internationally known Buddhist meditation teacher and author Bhante Henepola Gunaratana and others. They have a year-long schedule of retreats, including ones for beginners and youth. But be sure to register months in advance as people from form around the world and retreat spaces fill up fast. Last modified on 2008-11-22 04:45:57 GMT. 2 comments. Top. Edit topic. 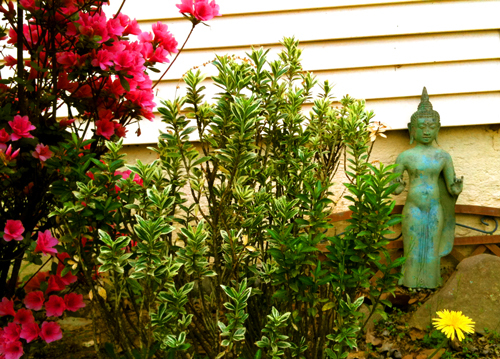 We’ve had a couple of requests for the metta (loving-kindness) meditation we do at the Meditation Circle of Charleston. It is adapted from a metta meditation done by Bhante Gunaratana, abbot at the Bhavana Society. May I be well, happy and peaceful. May no harm come to me, may difficulties not last long, may I have a calm, centered mind. May I have patience, insight, courage and compassion in meeting and overcoming the inevitable challenges, difficulties and failures in life. May my parents be well happy and peaceful. May no harm come to them, may difficulties not last long, may they have calm, centered minds. May they have patience, insight, courage and compassion in meeting and overcoming the inevitable challenges, difficulties and failures in life. May my teachers be well happy and peaceful. May no harm come to them, may difficulties not last long, may they have calm, centered minds. May they have patience, insight, courage and compassion in meeting and overcoming the inevitable challenges, difficulties and failures in life. May family members and relatives be well happy and peaceful. May no harm come to them, may difficulties not last long, may they have calm, centered minds. May they have patience, insight, courage and compassion in meeting and overcoming the inevitable challenges, difficulties and failures in life. May friends and acquaintances be well happy and peaceful. May no harm come to them, may difficulties not last long, may they have calm, centered minds. May they have patience, insight, courage and compassion in meeting and overcoming the inevitable challenges, difficulties and failures in life. May my enemies and those with whom I have trouble communicating be well happy and peaceful. May no harm come to them, may difficulties not last long, may they have calm, centered minds. May they have patience, insight, courage and compassion in meeting and overcoming the inevitable challenges, difficulties and failures in life. May indifferent persons be well happy and peaceful. May no harm come to them, may difficulties not last long, may they have calm, centered minds. May they have patience, insight, courage and compassion in meeting and overcoming the inevitable challenges, difficulties and failures in life. May all beings, with form and without form,visible and invisible, near and far, born or coming to birth, from the highest realms of existence to the lowest, be well happy and peaceful. May no harm come to them, may difficulties not last long, may they have calm, centered minds. May they have patience, insight, courage and compassion in meeting and overcoming the inevitable challenges, difficulties and failures in life.